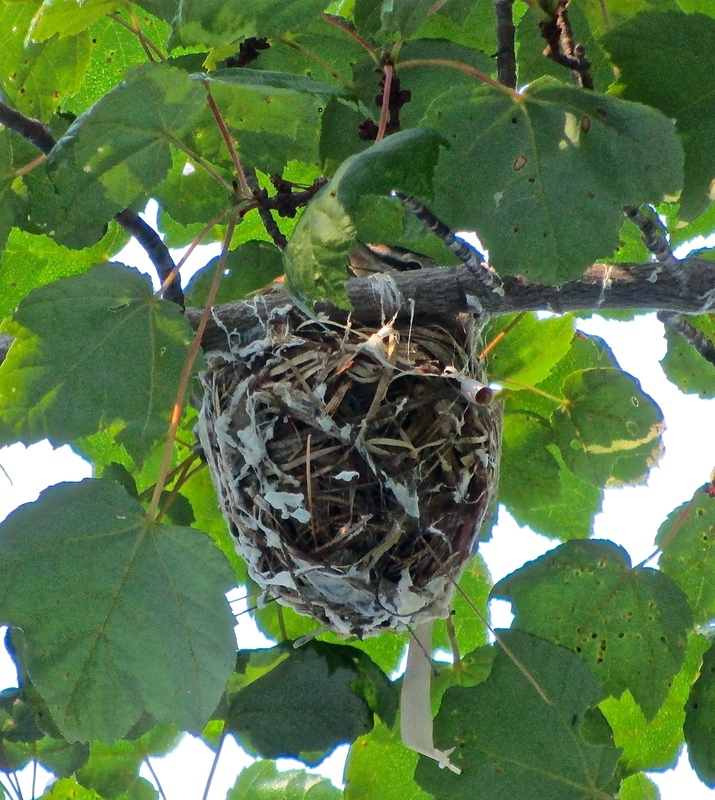 Not eight feet outside my studio window, a red-eyed vireo has built a nest. It is a wondrous thing of fine birch bark, pine needles and spider silk. The spider silk not only holds it together, but also holds it suspended on the twigs. I have been watching the vireo daily and I’m impressed with the quiet, most decidedly non-instant gratification life she leads. She sits on the nest, sometimes with eyes closed, for hours on end. During thunderstorms and driving rainstorms (the little basket-nest tossing, but holding) she sits. Once or twice a day, her mate visits the tree next to her and sings out a few lines of his song to say “this place is taken.” I’m flattered they have chosen to build their nest so close to our nest, as it were. I feel like I’ve been accepted as a part of nature. 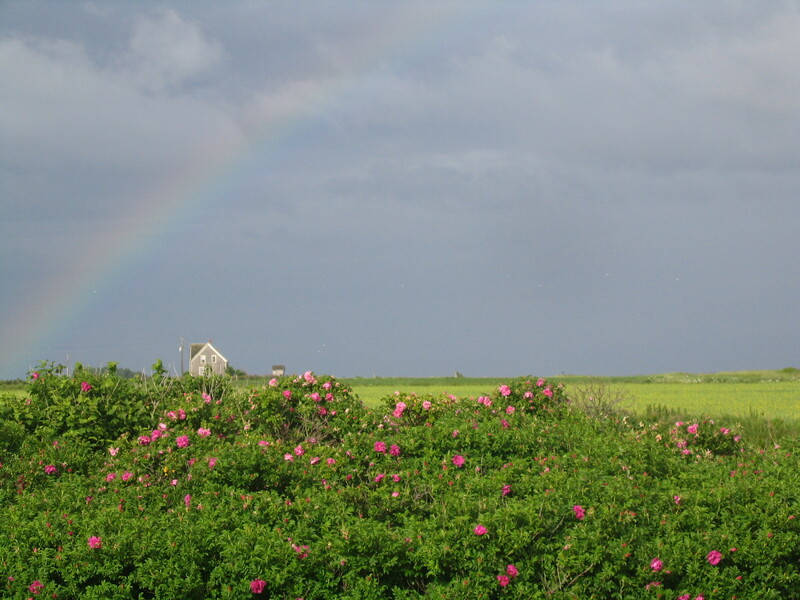 Observing this ordinary, but still wondrous, natural event brings Pope Francis’s recent Encyclical to mind. He knows what he’s talking about. We are from, of, and nurtured by nature, whether we know it or not. Our culture of instant gratification—the way we try to fill the holes in our souls with things—is a direct consequence of our emotional and physical separation from the natural world. The closer we nest ourselves into the natural world–noticing it, living in it, absorbing it–the closer we are to the small rhythms that nurture our well-being. Because what is well-being after all but simply a sense of belonging? I was filling up the watering can from the pond when I noticed a small bug-looking thing hanging from another bug on the dock steps. It was odd enough for me to take a closer look. 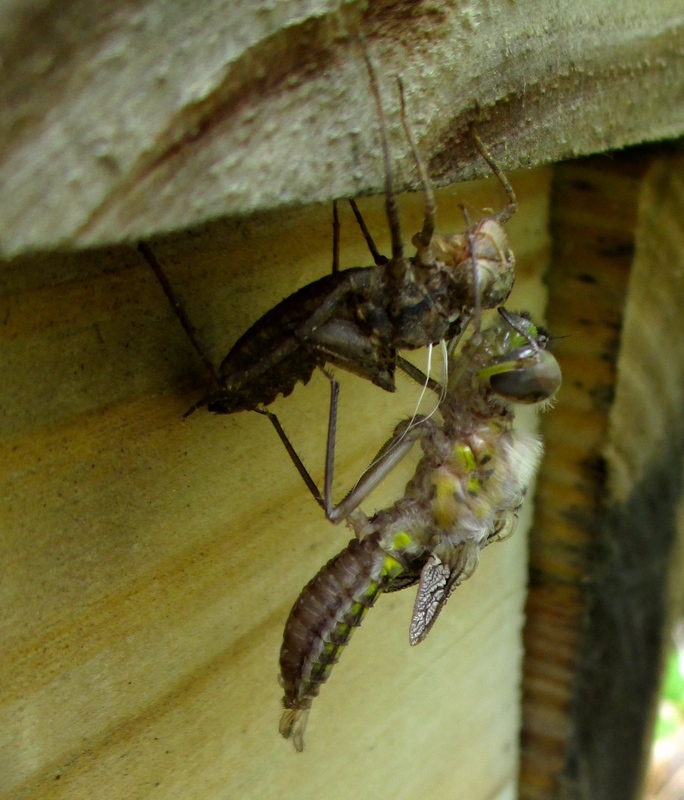 Then I realized I was seeing one bug emerging from a bug, or rather, a casing. 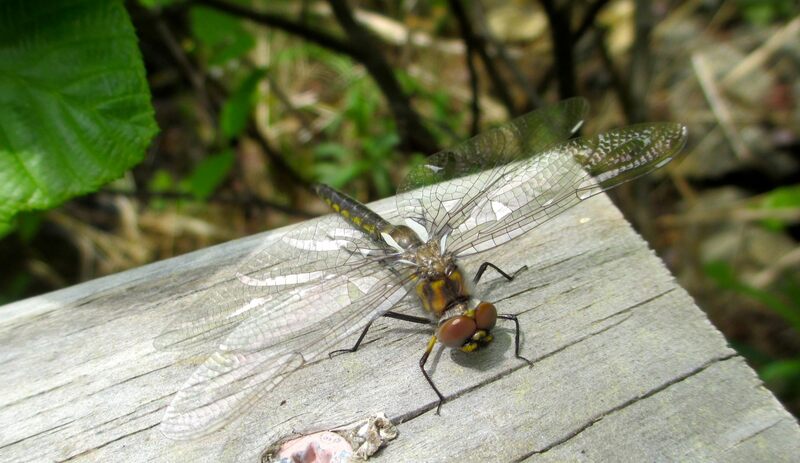 Dragonflies. Watering chores would have to wait. I got my glasses and camera and settled onto the warm planks of the dock to watch. 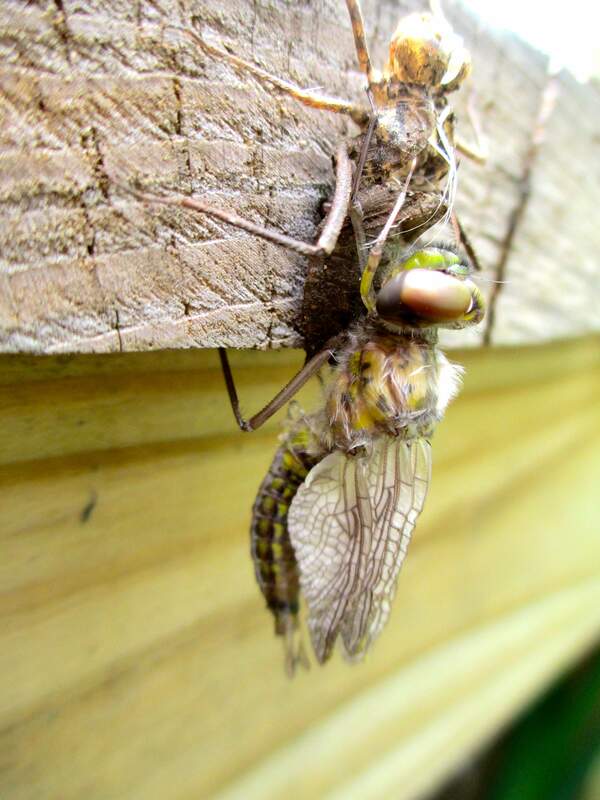 This bizarre looking thing is a dragonfly emerging from its nymph stage, where it has lived in the water for a year. I can’t wrap my head around how what was a bug is now a bug-casing and there’s a new bug coming out of it. The dragonfly has emerged. 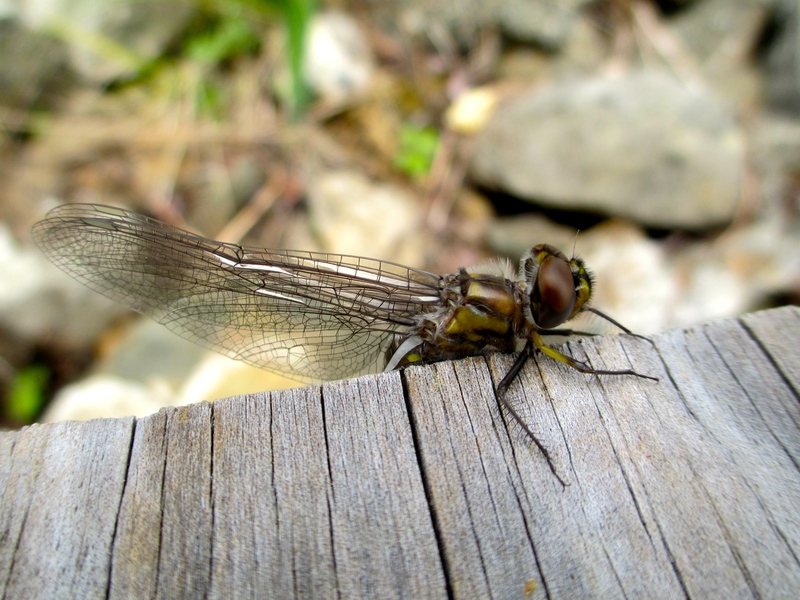 At this point, It looks more like a worm than a dragonfly, and see how tiny the wings are? As it hangs there, it gets larger and when I compare the casing it came out of, I wonder how it ever fit. 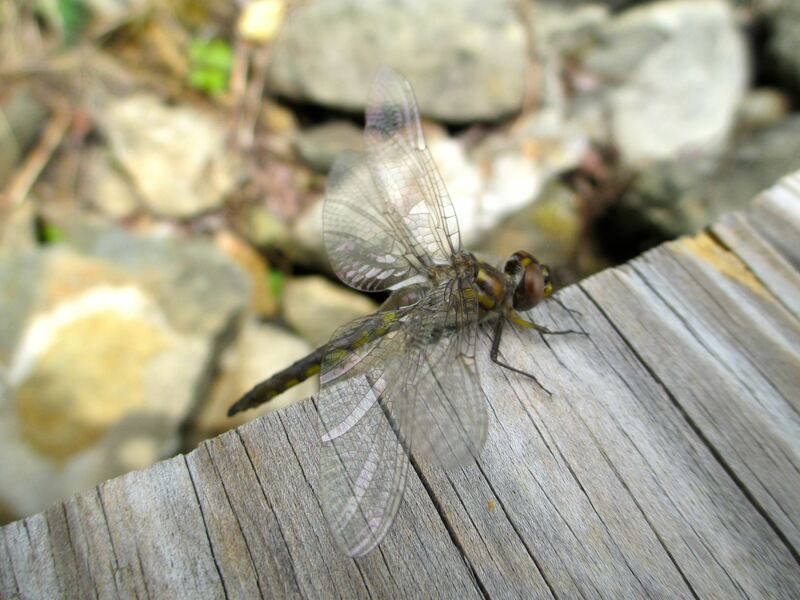 Then the wings grow–gossamer incredible bits of translucence. Are they unfolding or expanding or both? Really, it is a miracle. 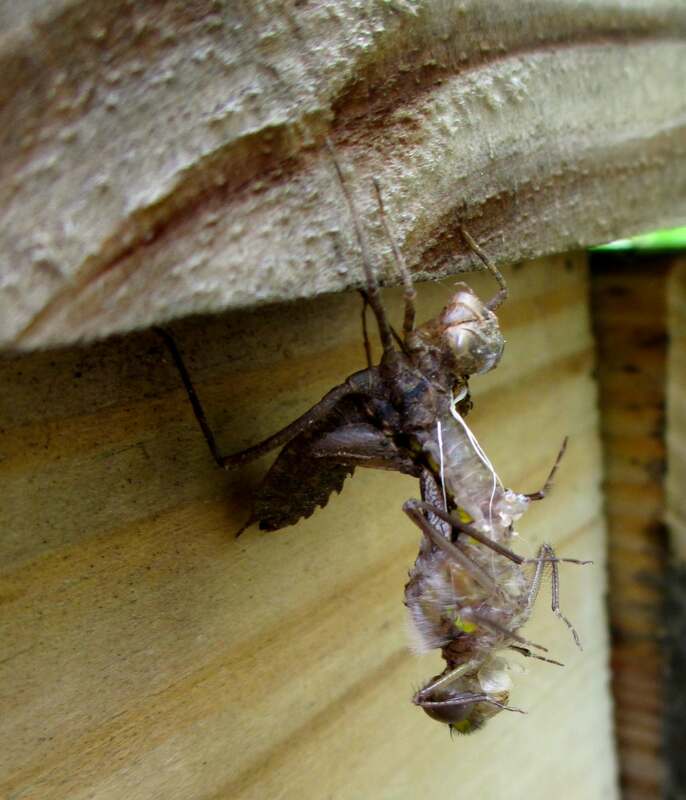 Then more hanging there while the wings get even larger. 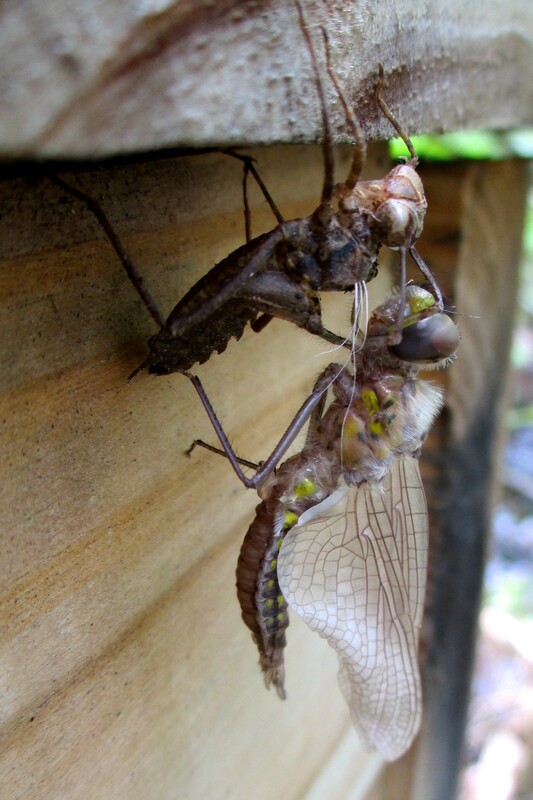 Now the dragonfly, looking like a dragonfly and twice as large as its original casing, crawls up and faces the wind. It takes its tiny legs and rubs them over its giant eyes. I am so, so eager to watch it fly. But it waits, wings back, more facing into the wind, more eye rubbing. And then it happens. The wings that have been up to now, straight back, suddenly open, two on each side, and like a prop plane warming up, they vibrate, feeling the wind. And then it takes off, up into the air, and away. From the water to the air, from an aquatic bug to a flying thing, in less than two hours. And we humans think we’re so clever with our gadgets. We’re just lumbering blind things, compared to this miracle. I just finished a book about the magic and mystery of the natural world and it thrilled my soul like all good books do, especially when the story has to do with forces we humans don’t understand. Today is Friday the 13th. And not only that, it’s a full moon—two weighted events in many people’s psyches. The full moon’s effect has entered our lexicon: lunacy, lunatic. And Friday the 13th is considered unlucky—13 being the number outside of the whole number of 12. I’m not sure why Friday, although I do know that sailors will not start a trip on a Friday—I know we didn’t in my family. But I don’t consider the full moon an adversary and I certainly don’t think Friday the 13th is unlucky. I’ve written about the full moon before Full Moon Dreams and you know that I pay attention to what is shown to me during this time, because instead of being half or fully buried it has now been brought up to a place where I can work with it. 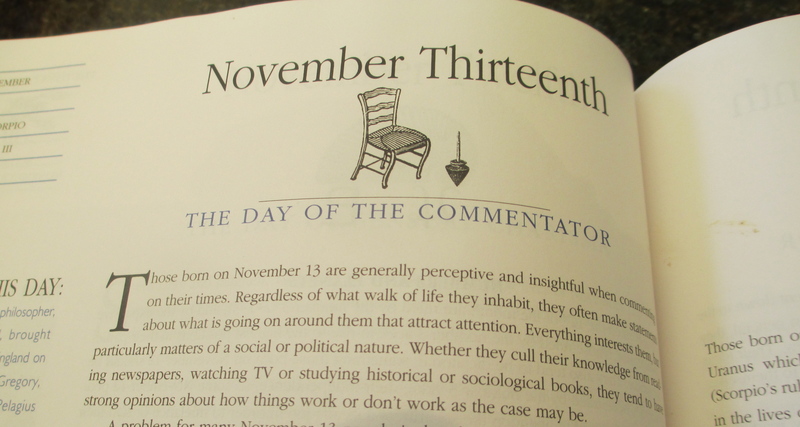 I was born on the 13th and I turned thirteen on Friday the 13th. And the day I turned thirteen on Friday the 13th was the full moon. I think “unlucky” is a way to describe events that happen to us that we don’t know how to process because they are not what we think we want to have happen to us. My personal belief is that everything that happens to me is for my highest good—that the natural world, of which I am a part, has my compassionate evolution in mind, not my destruction. So with that belief firmly seated in my soul, I gratefully take what the world gives me, trying to learn what I am supposed to learn. One last thing: my Buddhist name, given to me by my teacher, the late Peter Matthiessen, is Tsu Ki. It means, The Moon. This morning I woke up to an insistent bird song, over and over, clear and repeated. In my subconscious brain I said “oriole” but when my conscious brain took over, something wasn’t quite right for an oriole. Eventually the call came in the tree right outside. That was enough to make me get out of bed and crouch by the window. The bird was right there, but leaves obscured him and I only got a glimpse of his head, beak open in song. But because the light was behind him, his head was in silhouette and I couldn’t identify him. I was awake now, so I got dressed and went to the pond grate to clean it out—it was heavily blocked from the night’s beaver activity—pulling the pond muck into the wheelbarrow to use as mulch for my garden. As I was mucking, the darn birdcall came again. And once again, I could only see a silhouette against a far tree. I finished the mucking and went inside to get the binoculars. I stood outside in the middle of the yard. But of course, there was no birdcall. I swatted at mosquitoes. Nothing. I went inside to have coffee. Then, sitting at my computer, sipping coffee, a clear, LOUD birdcall came through my open window. I jumped up. There, not ten feet from me, was a brilliant orange and black bird. Baltimore Oriole. Showing himself off. Tired of the game, maybe. Or maybe taking pity on me. I’ve been sending out query letters all this week and as much as I want an instant response, it hasn’t happened. But Mr. Baltimore Oriole reminded me that sometimes if you can just wait, what you want will come to you. The pond is blustery this morning, skittishly turning from blue to brown as the wind gusts across it. I couldn’t stay inside. So I put on my rubber boots (the easiest things to grab) with no socks (takes too much time to put on socks) and tightened the belt of my baby blue velour bathrobe with the soot stains on the sleeves from building a fire in the woodstove chilly mornings. I tucked my raggedy sweatpants into the boots, arranged my Lanz of Salzburg flannel nightgown over them, remembered to take the binoculars and stepped out. It was quite the look, I’m sure. Especially when I remembered that I had slept in my blue topaz earrings, so they were dangling coquettishly. 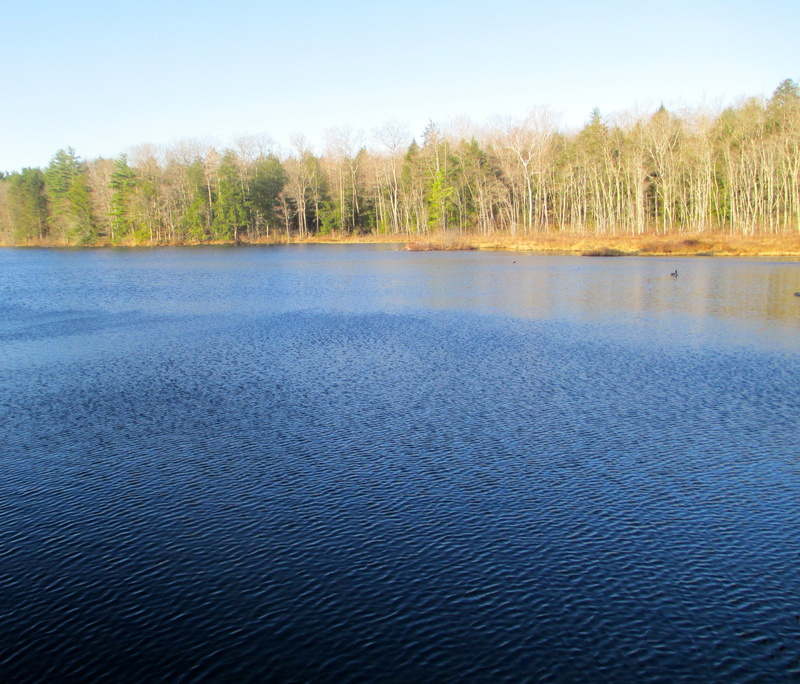 As I tromped over to the pond grate to clean it—a daily activity—a new birdcall gave me pause and I stopped to locate it. I keep a bird journal and each year I get excited when the migrants show up. I know this because when I look back on earlier years to see when, for instance, the fox sparrow has arrived, it has the same exclamation point next to it that I put on this year. I located the singing bird with the binoculars, trying to keep it in my sights as it danced along the spruce branches—no mean feat, especially since I hadn’t had my morning coffee yet. I looked for markers to identify it, but it was unremarkable—a buff colored little thing with a wing bar (but not a goldfinch.) Then I saw the glimmer of deep red—just a dot, really—on the top of its head. Ah ha! 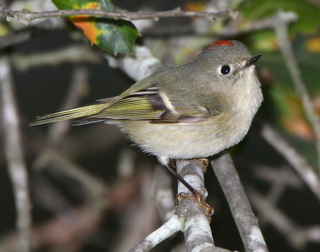 A ruby-crowned kinglet! I made my way back to the house, wrote ruby crowned kinglet (!) in my bird journal and then sat down next to the cheery wood stove and took a first sip of hot coffee. There is really only one thing to write about this week and that is SPRING. After a long winter we’ve had three days (three days! count ‘em!) of sun and above freezing temps. While my spring fever is not yet at the giddy stage, I do feel a low thrumming of anticipation running through me. Each morning I hear more birdsongs and the other evening I sat outside to stare at the one patch of open water near the house. 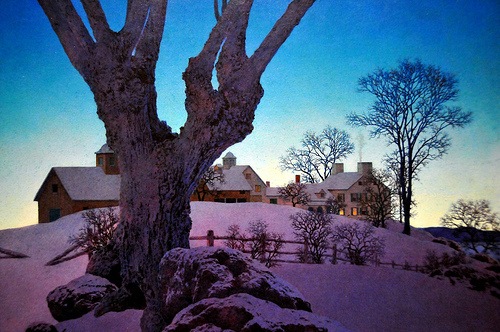 As dusk deepened, the sky became Maxfield Parrish blue and a perfect crescent of a moon glowed above the pines, reflecting in the water. I was waiting. And then I heard it. A sleek ripple and a snuffle. The otter. I sat and listened as it hunted, and then, hunting successfully, as the sounds turned to chomping and scraping. As winter loosens it grip and spring takes over, I rejoice in the fullness of coming to life again, of emerging from hibernation and wrapping my arms around the activity of spring. You have to earn spring. No instant gratification here—and it is all the sweeter for it. I’ve been knitting a sweater for the last twenty years. It’s true, I am a really slow knitter but I’m not that slow. Well, I am. I have quite a few “one socks” without the other—I knit one, it takes me forever, I never get around to knitting the other one. But this sweater is something that I am going to finish—I have one sleeve to go. I am determined. This sweater has a story (you would hope, right?) It begins with a dream to own a farm, which I did make true in my twenties and thirties. The farm had chickens and horses, but it needed a few sheep. So one spring morning, I drove my VW Rabbit diesel to another farm that raised sheep for hand spinning and bought two lambs—one white, one black. I stuck them in the backseat with some hay. Then I drove the two hours back to my farm, the lambs looking out the window, having never been in a car before. When I got home I put them in the pasture I had prepared. It was a lovely space bordered by a stone wall. Then next morning Dolly and Miranda (that’s what I named them) were gone. They had climbed over the wall and disappeared. I searched the woods, I met a neighbor who had a flock of sheep and said he would keep an eye out for them; I gave up hope by the end of the day. They were coyote food. I went to bed depressed. The next morning I got up at the dim early light of pre-dawn and went to let the chickens out. And who should appear, emerging from the woods across the road? Dolly and Miranda. When Dolly was a year old, I sheared her and it was from this first fleece—a rich dark brown—that I spun the wool to make the sweater. 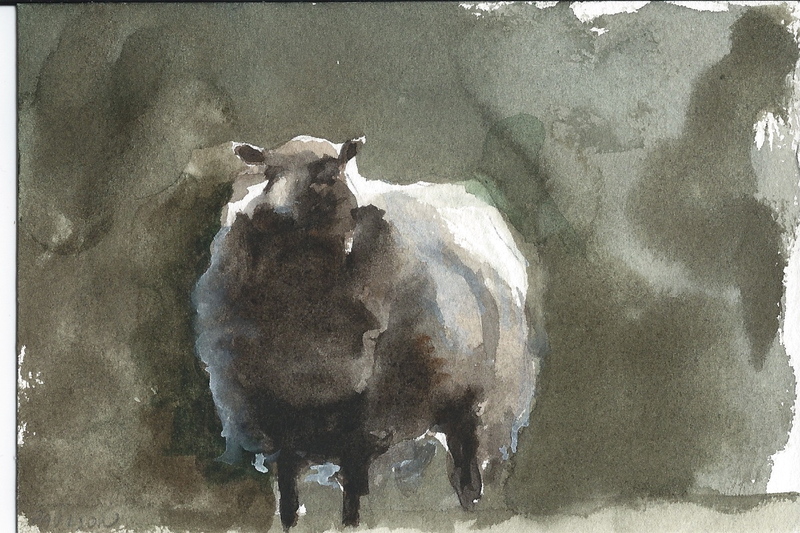 Dolly didn’t like being sheared—as a matter of fact for a sheep, Dolly had some strong opinions. But we both persevered, in our stubborn ways. I got the fleece, and she got kicks in. I want to justify taking so much time to knit a sweater and this is how I’m going to do it: I’m going to believe that this sweater is more than a bunch of loops in dark brown. It’s about dreaming a dream and staying stubborn in the belief that living your life the way it matters to you counts–whether you’re a human or a really stubborn sheep. Okay, I’ve changed my mind. 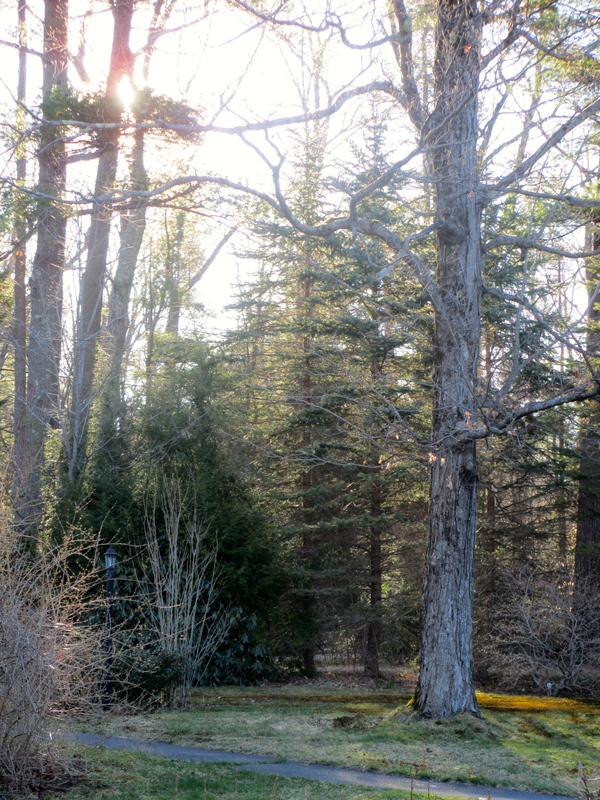 I re-posted something I wrote last year for this week’s post, and then I looked out the window at the grey and brown and white that has been here for quite a while and I saw a flash of yellow at the feeder. A goldfinch, just starting to turn! We may not think spring is coming, but the birds know it is. 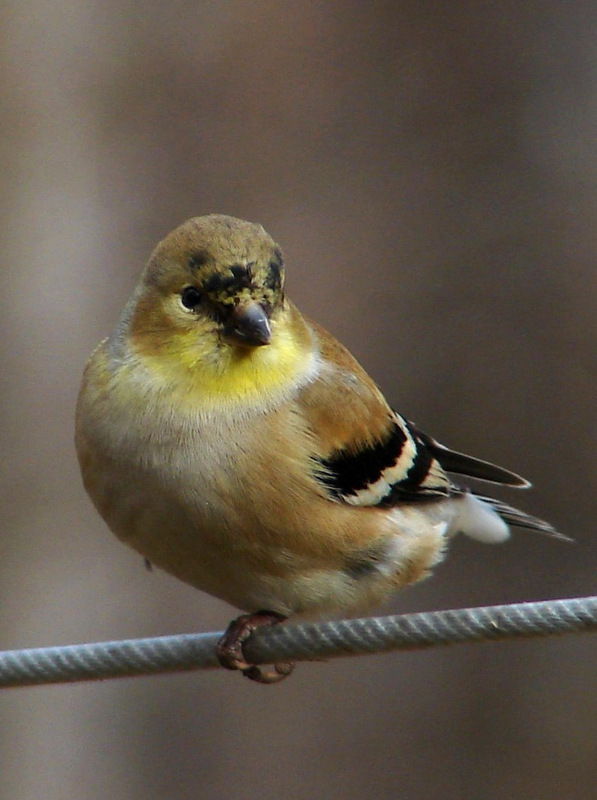 The goldfinches are beginning to turn that amazing shade of yellow, and bird songs are different now–more sing-song, more carefree, less terse. If I stop and just listen for a moment, I think I can even hear the icy grip of winter loosening. In the brook that has more laughter, in the ground that has a hint of cushion, in the minutely beginning swelling of buds. It makes my insides swell with nourishment, to see it and hear it.